A bin full of roselle at farmers market. One of the more unusual things in the last CSA box was roselle, grown by Cliff Middleton of Three Sisters Farm. 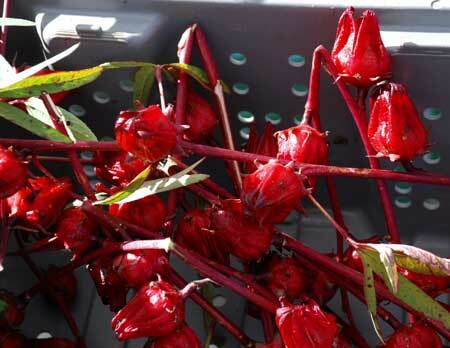 Roselle, also known as Jamaican sorrel, is a species of hibiscus used to make cranberry-tasting beverages. You might also know the drink as “jamaica” (pronounced ha-MAI-ka), popular in Latin countries. 1. Remove the buds from the stems using a sharp paring knife. 2. Carefully trim the fleshy red calyx away from each inner seed pod. 3. Boil the calyxes with some ginger root in a pot of water and let them steep for a good long time, 12 hours to overnight. The longer they steep, the stronger the flavor. 4. Sweeten with honey, or not, and enjoy the tart drink. Typically, you drink it chilled, but I suppose you could try it warm on a cold day. Pictures of boiling calyxes and the final drink are over on Farmer Muriel’s Little River Market Garden blog. Throw away the seed pods. They are immature and will not grow. You can’t eat them, either. The buds or calyxes will keep for a while in the refrigerator, but make sure the plastic bag they’re in is unzipped so they can breathe (or use those new zipper plastic bags with little holes in them for keeping produce). Fresh roselle was available at the Liberty City, South Miami farmers markets last week, and Overtown Roots in the City farmers market this week. Dried sorrel is available at Jamaican markets. Download last year’s CSA newsletter with a similar recipe and a bit more info on roselle. Saved seeds from the roselle in last year’s CSA box sprouted, no problem, so I’m curious why you say this year’s are “immature”? I haven’t yet done anything with the roselle I got at the Pinecrest Mkt last weekend, but I planned on saving those seeds too. Roselle also makes a very nice sweet/tart/savory relish (good with turkey and pork especially) and also there’s a great-sounding tart (pastry) recipe in Marian Van Atta’s book “Exotic Foods” – I’m going to try that.